Welcome to my THAO HIEU Homestay in Hoi An Anceint town – Vietnam. 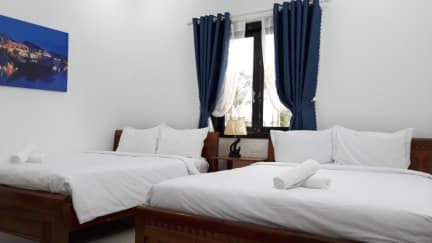 When visiting Hoi An you will feel right at home at Thao Hieu Homestay, which offers excellent quality and attentive service. The Homestay is less than 1 km from the Old Town center and only 3.5 Km from the beautiful An Bang beach by taxi or bicycle. We are level walking distance to rice fields for photography, cafes, banks (ATM), bakery, street food and clothes / shoe stores. From our convenient location guests can easily reach the many famous tourist attractions of the city, the villages, the river systems and the beaches. Thao Hieu Homestay via its staff and facilities will make every effort for you to feel comfortable and satisfied. Our Homestay has free Wi-Fi, breakfast garden and serving area, lockable storage and laundry services. All guest rooms offer air-con and are equipped with thoughtful amenities to ensure a relaxing and comfortable stay, with a common seating area to unwind at the end of a busy day of sightseeing or shopping. 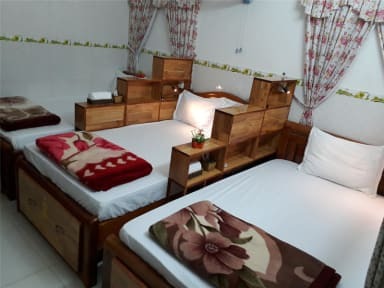 Thao Hieu Homestay Hoi An is situated in a very safe street amongst local Hoi An residents with very little through traffic. The homestay is run by a family, and they are really friendly and genuine. They offer sufficient breakfast with various choices, so we can go out with full energy everyday. They are willing to help customers deal with any problem or request as well. Most of all, the price is fair enough.